Anurag Kashyap has a lot of talent, says Aseem Chhabra. He just needs to stop making films that are very similar. Nawazuddin Siddiqui is one of the finest actors of our times. There is no argument about that. But too often -- including in films that have not been released, we have seen him as an angry man (Patang, Firaq, Dekh Indian Circus); or a creep, albeit with a heart (Liar's Dice, Miss Lovely, Talaash); or a dark criminal (Monsoon Shootout, Gangs of Wasseypur, Badlapur); or just a sleazy man (Haraamkhor). There is a decent man and even a comical Siddiqui in films like The Lunchbox and Bajrangi Bhaijaan. But time and again filmmakers prefer to hire the actor to play tough characters and I fear that he has already been typecast. That was my big concern in approaching Raman Raghav 2.0, where Siddiqui once again works with his mentor Anurag Kashyap (the two have collaborated on four projects, and a few more, if one counts films produced by Kashyap). And I was not proven wrong in watching Kashyap's latest film after last year's disaster Bombay Velvet. 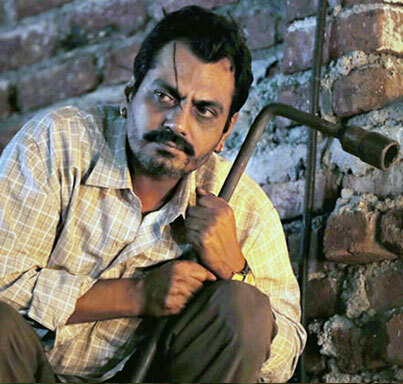 Raman Raghav 2.0 showcases Siddiqui at his creepiest best, where he walks around the streets of Mumbai with a wheel changing wrench and later just an iron rod as his murder weapons, portraying a copycat serial killer. Inspired by the original Raman Raghav who menaced Bombay in the 1960s with at least 41 murders and was later sentenced to life imprisonment, Kashyap's film, which he co-scripted with Vasan Bala, has the sense of deja vu. Yes, we have seen this Siddiqui before. But more important, Kashyap has already taken us on this journey before, the underbelly of mankind, or at least with characters spread out in Mumbai. There are tones of Raman Raghav 2.0 that were already present in That Girl With Yellow Boots and Kashyap's 2013 film Ugly. It is just that the characters, the mood, the darkness in Raman Raghav 2.0 has become uglier. And so while the film is tightly framed, with strong performances, and a sinister background score (an excellent job done by Ram Sampath) that adds to the dark mood, it has an overall nihilistic feel to it. At times I found a bit too much of Austrian filmmaker Michael Haneke's rather difficult to watch Funny Games in Raman Raghav 2.0. It was especially so in a sequence towards the beginning of the film where Siddiqui's Raman makes a surprise visit to his sister's apartment and ends up (no spoilers here since Raman's motives are quite clear from the beginning) beating them to death. Kashyap leaves us no room to feel sorry for Raman's victims, even when the sister Lakshmi is being played by the wonderful Marathi screen actress Amruta Subhash (Kila and the new film Island City). There is no time for us to care for the Raman's victims for once the murders happen, the film's tone immediately changes with a hip soundtrack, and in this case the song Behooda. And so while Varun Grover's lyrics say Teri Khaal Main Rainge Keede, Tu Sachha Behooda, I can almost see this song becoming a dance hall hit among the younger generation. All of this is very unsettling. A few years ago I interviewed Kashyap about the violence in his films, especially in references of his magnum opus Gangs of Wasseypur. And one thing he told me was that he rarely shows violence on the screen. Much of what the audience think they have seen is coming from their own imagination. And that is true in Raman Raghav 2.0. Just as Haneke scared the hell out of us in Funny Games, without really showing the killings, Kashyap also leaves the brutality of the murders to our imagination, using a strong sound design, and then showing traces of blood on the floor, or dripping from the metal rods that Raman uses. But emotionally we feel empty. We cannot empathise with the killer, but his victims barely have time to grow on us. If we start to care for them at all -- and Subhash's Lakshmi does show her warm human side -- Kashyap pulls us away from the scenario as soon as he can. Siddiqui's Raman has a larger goal. He is searching for his soulmate -- the Raghav who would complete him. And he finds him in the cocaine snorting, sleep-deprived cop played by Vicky Kaushal, who also has no qualms about killing people if it suits his moods and needs. The cat and mouse game that Raman Raghav 2.0 plays out is meant for this realisation to come to the audience and, of course, to Kaushal's Raghav as well. Raghav is as depraved as Raman, killing random people if his drug infused mind sets him on that track. There are some killings that do not make sense, such as the time when Raghav kills a Nigerian drug peddler (presumably that is what this character does), other than to suit Kashyap's message of the cop and the serial killer being the two sides of the same coin. If there is one big surprise in Raman Raghav 2.0, it is Vicky Kaushal's star-making performance, a far turn from his heartbreaking innocent Deepak character in last year's Masaan. As cocaine takes total control of Raghav, the cop starts to break apart. His misogynist acts again makes Raman Raghav 2.0 a difficult film to really admire. Kaushal displays a lot of brave acting, including a terrific confrontation scene with his father (Vipin Sharma in a brief appearance). There is real good cinema in that scene towards the end of the film, and also a reminder that Kashyap has a lot of talent. He just needs to stop making films that are very similar.